Tobacco - White Buffalo Trading Co. Note: I wrote this for Indian tobacco, but it can be applied to all tobacco growing and curing. 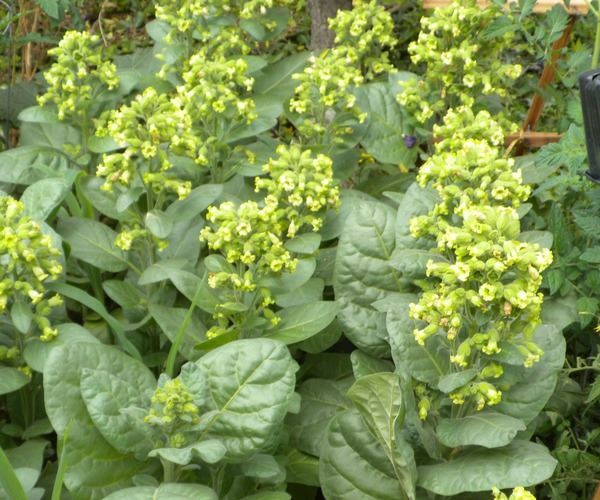 Nicotiana Rustica is a delightful plant to grow. 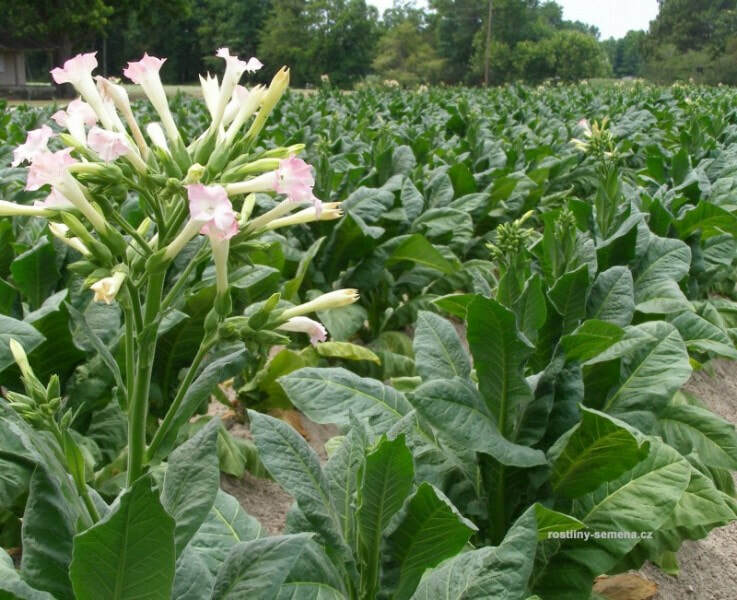 Rich in Native American history, a true heirloom tobacco with deadly high amounts of nicotine. Excellent pesticide. Used in tipi ceremonies by many tribes in a traditional peace pipe, always mixed with sweetgrass, mugwort and/or wild mint. As a plant, its pungent odor can be sensed many meters away and is both intoxicating and unpleasant to some. Annual; sometimes biennial in temperate climates. Time from seed to bloom is about two to three months. Growth is slow at first as they develop deep roots very quickly, then the main stalk will grow fast and support huge, thick leaves on a short frame. Hardy once established. Mature plants tolerate drought, insects, heavy rain, wind and even light frost. 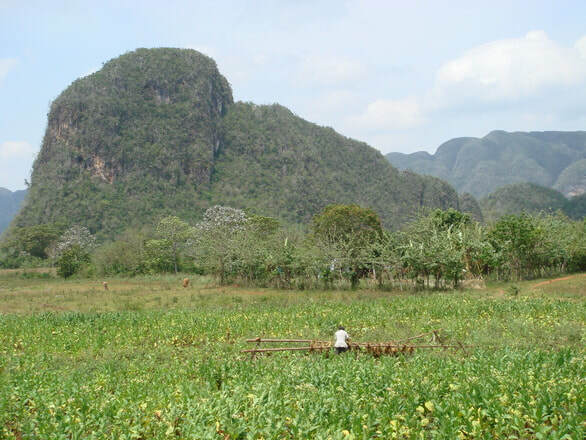 This is the original, wild, native tobacco from which the now common and highly cultivated, cross-bred plant called N. tabacum was developed. Rustica grows only a few feet high and produces many clusters of tubular yellow flowers which are pollinated by hummingbirds. Its leaves are dark green, thick, sticky, slightly oblong with small hairs, and about six to eight inches in diameter. The plant produces a noticeable odor that some may find unpleasant and others intoxicating. Speaking of the latter, the first time I went to pick rustica seeds at dusk, I inhaled the odor and immediately began to hear ancient native drumming sounds, literally. Nicotiana rustica, known in South America as Mapacho and in Vietnam as Thuoc Lao (thuốc lào), is a plant in the Solanaceae family. 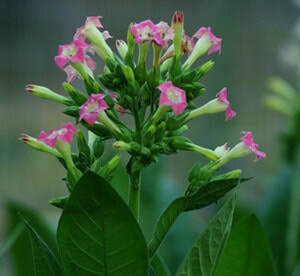 It is a very potent species of tobacco. 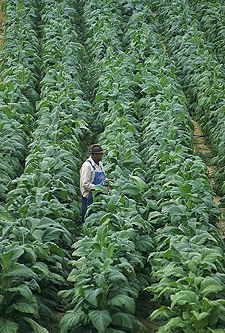 The high concentration of nicotine in its leaves makes it useful for creating organic pesticides. The current experimental cure for the ebola virus consists primarily of three different extracts taken from lab grown tobacco plants. While nicotine is a very strong and deadly poison, tobacco has other qualities. Some South American peoples have used a concentrated infusion of this heirloom tobacco to poison their hunting arrows. 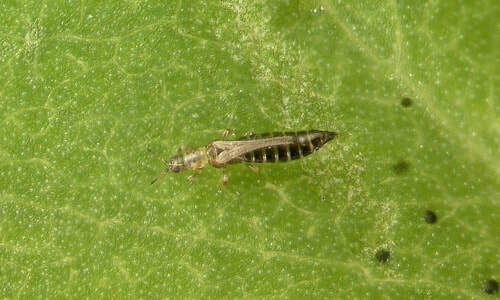 When powdered, the leaves can also be used to make a potent, nicotine-based insecticide. Rustica is considered toxic to ingest in any form. Those trying to smoke it will likely be rendered unconscious from nicotine poisoning. Native peoples mixed it with sweet grass and mint and other mellowing herbs and did not inhale deeply on the rare occasion of smoking a traditional "peace" pipe made of bloodstone. Rustica is also used for entheogenic purposes by South American shamans. It contains up to ten times more nicotine than common North American varieties such as N. tabacum. Other reasons for its shamanic use are the comparatively high levels of MAOI beta-carbolines, including the Harmala alkaloids, harman and norharman. Most commonly, it is allowed to soak in water, and the water is then insufflated; it is also smoked in cigars and used as an enema and as an anthelmintic effective against tapeworm infections. In the southeastern part of Turkey, people use this herb and ashes of some trees to make a snuff called "Maraş Out." They use this by putting it under their lips like Swedish snuff. Rustica is also a common admixture of Ayahuasca in some parts of the rain forest. In Russia, N. rustica is called "makhorka" (махорка). 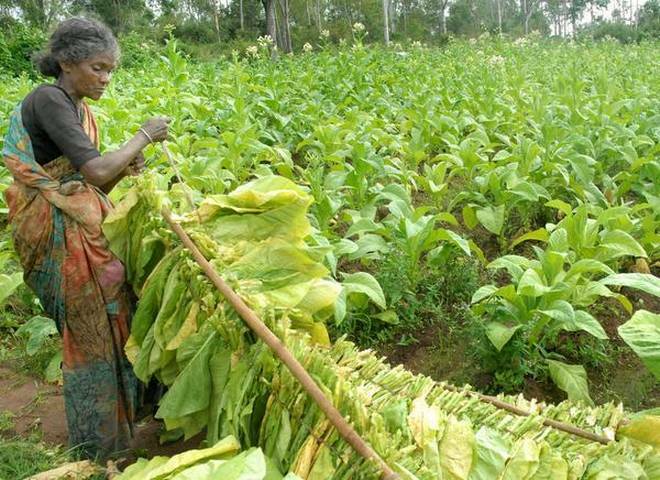 It was smoked casually by the lower classes before common tobacco became widely available after WWII, and is still smoked by some peasants and farmers today. 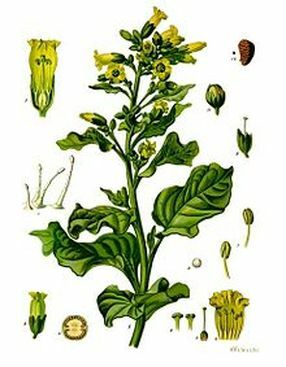 Nicotiana rustica leaves have a nicotine content as high as 9%, whereas Nicotiana tabacum (common tobacco) leaves contain about 1-3%. Cigarette companies add nicotine to their product to make it more addictive. Start tobacco seeds in 4-inch pots. Do NOT cover seeds. Average temp should be 70-80 degrees. Keep soil moist or misted until sprouts appear, then lower the humidity. Seeds germinate in 7-14 days. Once several sets of leaves are present, and all danger of frost is past, the young plants can be transferred to the garden, after a period of hardening off. Direct sow also will work, however, young plants are tender and vulnerable to the elements. Suitable for containers. Self seeding. High pollination and germination rates for most tobacco plants. Young plants are vulnerable to drought, wind, harsh sun and heavy rain. Although deep rooted even when young, they are tender at first. Direct sow or plant in peat pots to avoid transplant shock. Being in the Nightshade family, their needs are similar to tomatoes, and growing them requires similar conditions. Prefers full sun and deep watering that is not overhead. Also likes slightly acidic soil. Survives mild frost and will bloom into winter until killed by hard freeze or drought. In mild climate, Rustica may last two full years and bloom constantly. Rustica seeds have a high but sporadic germination rate, just like most Nightshades. I once had a flat of tomatoes that sprouted. I pulled all the young plants out to go into pots and set the remains of the tray aside. When I accidentally hit it with the garden hose a week or two later, at least a dozen new tomatoes sprouted from the 'dead' remains. I also have had a six pack of peppers fail to sprout at all. I reused the potting soil in a new homemade batch, and two weeks later noticed all the peppers sprouting up all over in pots that were now growing other plants. Nearly all the seeds failed, but then weeks later, nearly all of them sprouted. Nightshades are really peculiar in this way. The genetics make the seeds sprout at different times to ensure the survival of the species, so be aware that seemingly dead seeds that are well watered and seem dead can come to life after drying up with one watering, sometimes weeks after you have given up. There are a few different varieties of Burley seed that can be used for cigarette, cigar and pipe smoking and it tends to have a smooth flavor. It can be used for chewing as well. Lower in sugar. Usually used for either cigar or pipe smoking, but can also be chewed. High in nicotine and usually grown in a tropical environment. A plant that is usually used for ornamental purposes. The plant gives off an aroma and tends to have a very low nicotine content. These plants can reach a height of five feet with a leaf size of upwards of three inches. The complexion of the plant ranges from yellow through to brown. Flowers tend to be brightly colored and highly scented. Native American tobacco. 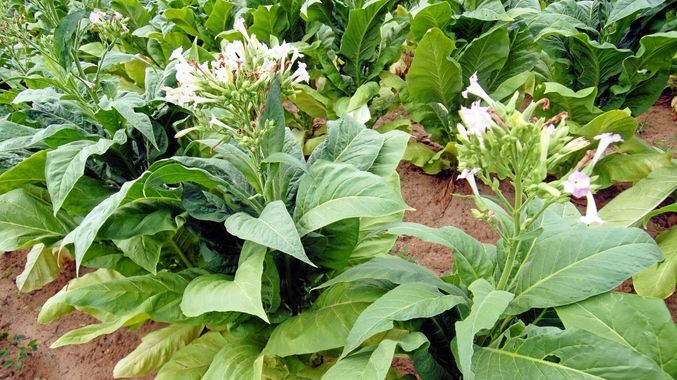 This type of tobacco is also grown in the sub-continent (India, Pakistan and a lot of the surrounding nations), as well as some parts of Africa and South America. 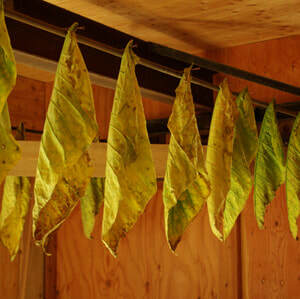 The smoking tobaccos must all be properly dried to give a good smoke. 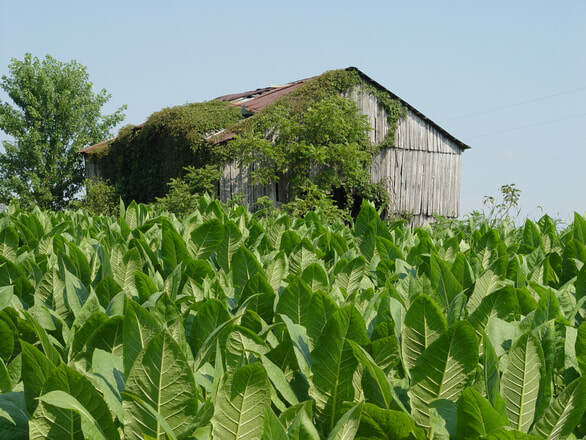 Swings in both temperature and humidity that are normal during fall in the tobacco growing states such as Virginia and Carolina are perfect for the curing of tobacco leaves. Normally, you must decide to grow either leaves OR seeds. Commercial growers clip off the flowers so that the plant puts all of its energy into the leaves. When picking your leaves, look to pick the upper canopy of leaves as these are sweeter compared to the tougher lower leaves. 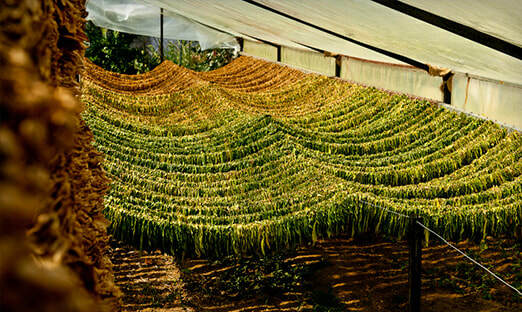 The green leaves are picked at full breadth, about two weeks after the flowers are cut, and traditionally strung a half inch apart on thin wires. Screens may be used in smaller operations. Humidity must be high, around 80% is ideal during the day. Always cure in full shade, either a shed or attic is typical, but a greenhouse may also work. If dried too fast, the leaves stay green and uncured. After two months, the cured leaves turn yellow to light golden brown. Dry until the stems break easily. Store in cardboard boxes to age and cure even more. Aging allows time for the nitrogen compounds to break down, which removes the harshness and lets the flavors come out. High humidity allows for slow drying. Once cured, tobacco leaves are typically cut into small pieces. 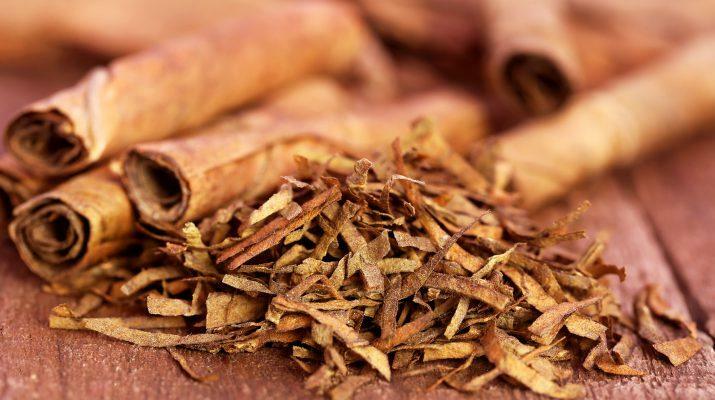 Dried leaves may be softened again with humidity to be hand-rolled into Cuban style cigars. If growing for seed stock, the leaves will not be as suitable for smoking, but can still be picked and dried as the flowers mature. © Copyright 2012-2019, Datura Don, White Buffalo Trading.